I flew to Palestine on October 3 and returned on October 11 for my regular, annual visit to the Nassar family farm. I was joined by Beth Moore, our Tour Coordinator; we were there to represent Friends of Tent of Nations North America (FOTONNA) at the ceremony awarding the 2017 Peace Award by the Methodist World Council to the Nassar family. Early on, there was a discussion between the family and the Council members about where the ceremony should be held. The Council felt that such an awe-inspiring moment should be held in one of the magnificent churches on holy ground in the City of Bethlehem. The family felt that it should be held where the Tent of Nations resides in real life – on the farm. In all humility in honor of the award, Daoud felt that “We all should get our feet a bit dusty.” Eventually, that is where the ceremony was held on Thursday, October 11, 2018 at 4:00 p.m. The ceremony and feast afterwards was really produced, directed and serviced through the hands, feet and voices of members of the extended Nassar family. Shadin Nassar, Daoud and Jihan’s older daughter, was the master of ceremonies, and at age 19, she is also a student in the Bard College Program for International Law at Al Kuds University in East Jerusalem. Nardine, the younger daughter, led a dance group’s performance of several traditional Palestinian dances as well as performing in the brass ensemble, along with Shadin. 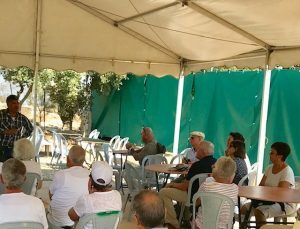 The son, Bishara, though slightly incapacitated by an injured hand, circulated throughout the gathered crowd of nearly 100 guests making them feel welcome, as he is prone to do everywhere. During the week of preparation, Daoud had this plan to build a temporary, 100-foot-long “wall” made of plasticized canvas for the purpose of separating the meeting tent from the new compost toilets and, beyond that, hiding the view of the settlement of Neve Daniele and the giant campus of the new Yeshiva school for children located in the background. I had arrived a week early to help with the preparations. Building a wall was not one I had expected to do; after all, the TON project had been about building bridges and tearing down walls for 15 years. What was this he was a proposing? Daoud’s intent was to provide a quiet space for the 100 guests to share a meal after the ceremony under the canopy of the tent. 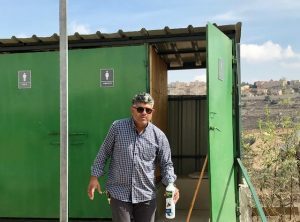 He wanted to build a flexible wall to avoid the sight of the toilets, as well as hide the ever-expanding annexation of lands by the Israeli government on the other side of the chain link fence containing the hundred-acre farm. The structures of aluminum poles and wire to attach the tops and bottoms of the canvas were already put in place, with the help of two German volunteers. Our task was to link the material by snaps at the tops and bottoms of the 10×10-foot sections along the entire length of the 100-foot wall. Because it was a curtain, it was designed to be opened and closed for the event that night and would only be used for such occasions in the future. In any case, it was not a permanent wall. 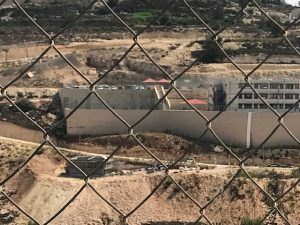 Besides, there were plenty of spots on the farm where the creeping presence of the “real” wall, gained through continuous annexation of lands of ousted Palestinian farmers, was there to remind us of the oppressive nature of life within the more permanent walls of the occupation. While initially put off by the construction of a “wall,” during our labor together I began to think that it was actually another example of how the Tent of Nations project applied its non-violent approach to the Israeli occupation in another creative way. I likened it to the development of solar panels to provide electricity where there was none before. Or the transformation of cisterns into life-holding water sources. Or building under the ground when forbidden to build on the ground. In this case, the “wall” was constructed by the oppressed and was under their own control. From their side of the wall, the color of green was certainly more pleasant than the towering gray walls that the Israelis are building to separate themselves from the Palestinians. There is certainly something empowering in defining your own terms of settlement. No longer the oppressed nor becoming like the oppressor – just refusing to be enemies – and inviting people to “come and see” and “go and tell” the story from their side of the wall.